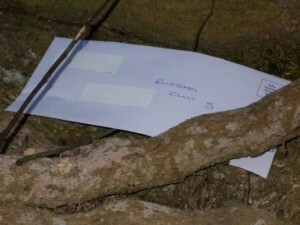 I was up at the crack of dawn – well, OK, 7 o’clock but it felt like the crack of dawn – laying out the clues for the Ruadhri’s Easter Egg treasure hunt and Caiti’s Easter geocache trail. 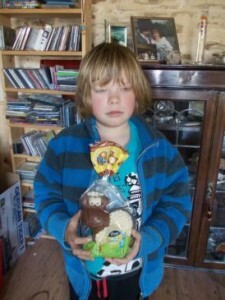 It’s our Easter tradition to make the kids work for their chocolate. 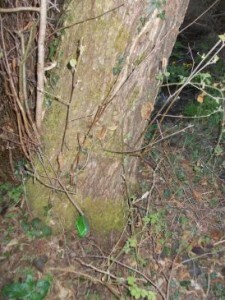 A cuckoo was calling and I caught a glimpse of it flying between trees. 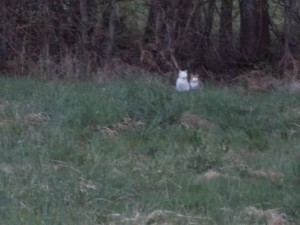 There were some deer in Dog Leg Field which I saw and the cats saw, but Nessie the dog didn’t! 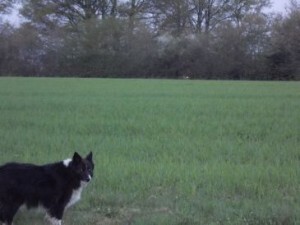 Dog Leg is a huge field, currently with cereals in but we’re thinking of grassing it for next year. Wendy and Voltaire tagged along too in case food was involved somewhere. They went on strike part of the way round. Rors was soon up and completed his trail successfully, without any help at all. He demanded harder clues for next year! They weren’t that easy, but I learnt not to be too cryptic with our Benj. He’d get into such a sulk if he couldn’t work out a clue. So, Rors got his reward – possibly the only lamb we will see today. No. 27 is still holding out but her belly is practically dragging along the ground so surely it can’t be much longer now! 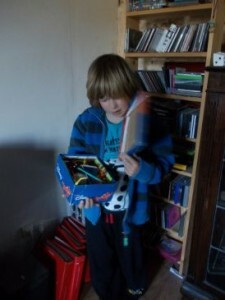 I did Easter boxes for everyone this year, including Chris. 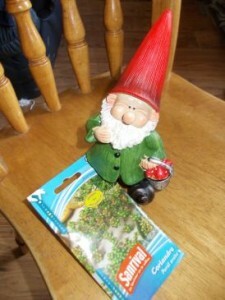 He got a garden gnome for the polytunnel and coriander seeds in his. Talking of seeds, we’ve found a good way to get seeds germinating. 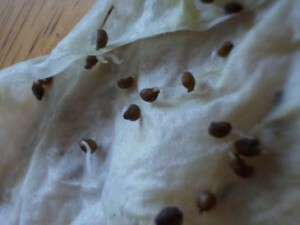 One lot of tomatoes and my anis (aniseed) and pepper seeds were staying soundly asleep, so we sprinkled some more onto damp tissue which we rolled up and put in a plastic bag in a warm spot – on top of the fridge just above the heat displacement thingy. Lo and behold, they’ve sprung into life. 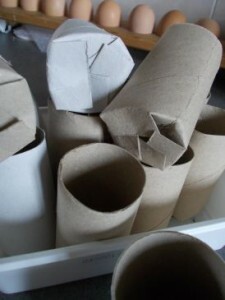 I’ve also been making some recycled seed pots out of toilet roll inners. Very easy. Cut five slits a couple of cms long at roughly even intervals around one end and then tuck those in and you have a little pot. They tend to be a bit wobbly so you’ll need to put them in a container of some sort or tie them together with string for stability in the greenhouse. But once the seedling is growing well, dig a hole and shove them out as they are into the garden. The cardboard will soon rot away and you’re left with your healthy plant. And don’t forget to enter the Expat Blog Hop on 23 April. No catches, just fun! Sign up on this page. All that remains is to say is Happy Easter!